Our ThermalDry flooring, for example, will not bow or warp like common wooden floors; plus it comes with a 50-year guarantee against mold and mildew growth. Our lightweight, bright ceiling tiles not only add light to your home’s lower level, but can also effectively deaden any noise or sound to ensure that basement activities aren’t heard throughout the house. And our eco-friendly SaniDry basement dehumidifier removes and prevents harmful mold and mildew growth to ensure a safe and healthy Virginia basement. We chose DryZone because we needed our basement finished and their product was great. The work was great and they always arrived on time. Craftsmanship was amazing and they always cleaned up after themselves. Those guys were terrific. I would heartily recommend DryZone to install any basement finishing system, egress window, or sump pump system. Brad quoted us a price, and that is the price we paid, no hidden costs. The materials that were used were all of excellent quality. Our basement was transformed into a beautiful living space. We don't have to worry about moisture or water after they completed their work. They also stand behind their work. Supervisory personnel came and inspected the work upon completion and made sure that anything that was scratched or damaged during installation (ie. floor and ceiling tiles) were replaced. Building inspectors came out at several points during construction and verified that everything was was up to code. Also, we had the work done in the fall and after the winter the dirt around the egress well had settled. They came right out and filled it in again. I would definitely recommend DryZone to anyone having some basement work done. 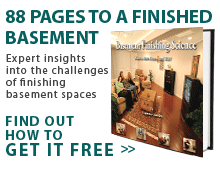 A finished basement is a hot commodity in today’s housing market. In fact, a Virginia home with a finished basement often sells for up to 20% more than one with an unused, dark, and musty basement. To increase your home’s resale value and expand its usable square footage, contact our Virginia basement finishing contractors today. Whether you’d like to remodel your basement into a home office, TV room, spare bedroom and bath, or game room, our Virginia basement remodeling contractors can complete the job in a timely and affordable manner. Simply tell us your vision, and in no time, we’ll make it a reality! If you live in Virginia Beach, Norfolk, Chesapeake, Arlington, or Richmond, contact one of our basement remodeling contractors to receive a free consultation and estimate!